Hard To Make A Buck In Detroit - Cars! Cars! Cars! Japan? Well, that's another story. CNN/Money reports: Rising costs weigh on U.S. carmakers' profits. At least the first reason in the article wasn't union costs. U.S. automakers face a widening gap in profitability per vehicle compared to their major Japanese rivals because of missed design opportunities, heavy discounting and high labor costs, a study released Monday said. We'd love to see better design come out of Detroit, since they've had only a few successes lately: the Ford Fusion, the Pontiac Solstice/Saturn Sky (Sky is a little nicer), and the Dodge Charger. Now, that being said, we also kinda like the Ford Five Hundred and we even question our own negative ways when we ask ourselves, "What's really wrong with the Impala (pictured)?" No, it's not a bold move (or is that Ford? ), but the Impala isn't supposed to be. The Solstice and Sky do that pretty nicely. 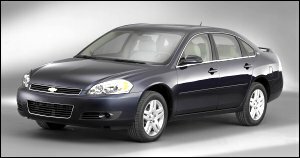 Anyone here looking to buy an Impala? How come? That's a snap of the 2007 Chevy Impala. Not only is it "not so bad"; it's even near good. Right? Or are we just getting old? I like the current Impala. I like the crisp, clean styling and think it is a HUGE improvement over the previous one that had the huge slab of ruby plastic across the back and looked generally dorky. I wouldn't even consider an Impala. I can't imagine ever seeing one that wasn't a rental. Adn you must be getting old. That car has no soul, no presence, no anything. Even stuffed with a V-8, it fails to impress.